Whether you are looking to spend a day experiencing College life hands-on or simply get a bit more information while on campus, we have an option for you. Listed below are upcoming opportunities to visit and learn more about the UA College of Engineering. Get all the essentials in a 45-minute info session covering the College’s admissions processes, 15 degree programs, research, clubs, residential communities and more. During the academic year (after Labor Day, through early May), sessions will be held at 9 a.m. Mondays, Wednesdays, and Fridays; meetings by appointment are available Tuesdays and Thursdays. During summer months (beginning May 4th, through Labor Day), sessions will be held Mondays and Fridays at 11:30 a.m.; meetings by appointment are available Tuesdays, Wednesdays, or Thursdays. Register through UA Admissions at the same time you sign up for a campus tour. Walk-ins are always welcome. All information sessions are held at the Old Engineering Building in Room 200. To make an appointment, contact us at engr-admissions@email.arizona.edu. Try out life on campus. 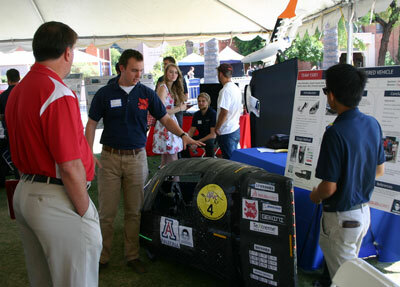 The College of Engineering provides information, presentations and tours during many UA visit events. Choose an experience that suits you, and discover all the University has to offer. Student shadowing can be scheduled around other visits to campus. The spring 2019 shadow program is available January 14–April 26. Please note: Shadow visits are not available on holidays (for example, MLK Day on January 21) or during UA spring break (March 4–8). Campus Tours: Take a walking tour of our beautiful campus! Honors College information sessions: Learn about Honors courses, residence halls, scholarships and study abroad. Other appointments on campus: Use the opportunity to delve deeper into the College of Engineering. Design Day is an annual College of Engineering event that showcases seniors’ real-world projects, many of which become commercial products. Last spring’s Design Day featured more than 120 projects, 600 students, and nearly $35,000 worth of industry-sponsored prizes. The event is open to the community, so mark your calendar, and join us on April 29, 2019! If you are considering the UA as the next step in your educational journey, welcome! Please schedule an appointment with Dr. Joe McCollough, jmccollo@email.arizona.edu, to learn more about academic programs or have your transfer coursework evaluated. Reach out to jmccollo@email.arizona.edu for more information. Take a closer look at UA Engineering programs and learn more about the University’s admissions process. 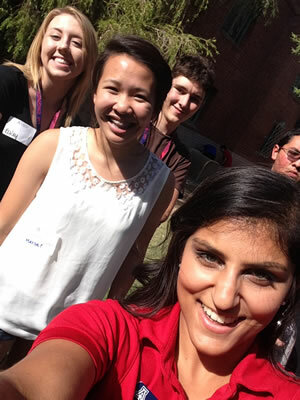 Engineering transfer student info sessions are held during the academic year at 1 p.m. on Fridays prior to the UA Transfer Round-Up Tours. Check the registration link for more details. Transfer Info Sessions are held in the Engineering Building, Room 200. Find out about the College of Engineering and get an instant admissions decision at these events hosted by the UA Office of Admissions and the College of Engineering. Watch for 2018-2019 dates to come!